I still get asked by people why I make such a big fuss over palm oil. It usually throws me off balance as I am surrounded by so many people who are "in the know." People that keep themselves updated on the mayhem associated with palm oil cultivation. Caught off balance, my usual reply is: "Um... it destroys millions of acres of forests every year?" That answer does not always convince them that palm oil is an issue they should look into. Even conservation-minded strangers I meet are quick to point out that lots of forests are destroyed in other countries for reasons that have nothing to do with palm oil. Palm oil trolls especially like to remind me that developed countries have policies that favor food over conservation with measures like the controlled populations of bison and wolves in Russia. It's hard to argue against reasoning like this, especially when they pile on the fact that big cities in the West are a major source of greenhouse gases. That the cars we drive and even the tablets and computers we use to complain about palm oil, are indeed drivers for environmental mayhem. Backed into this corner, I like to acknowledge that yes, I am that consumer. I am Joe Average, who reads about palm oil mayhem on a tablet that may have destroyed forests in Africa but it also makes me their customer as I buy products that contain palm oil. As their customer, I am always right. So when I insist that palm oil cultivation be clean and free of human rights abuses and wild life extinctions, I have that right to do so. Another argument I get is from palm oil trolls who tell me that North America is a very small user of palm oil and that we will not be able to have any influence over the industry. This is quite true, figures from the U.S. Department of Agriculture show the imports of palm oil into the USA as a paltry 1.2 million metric tonnes for 2013. I've seen these folks offer the same argument to get Australian or European activists to accept that they're all tiny customers with no relevance to an industry that pumps out over 50 million tons of palm year annually. Divided this way, pro-palm oil types hope we get a sense of hopelessness and give up our protests. What they forget to mention, whether through ignorance or by intention, is that cumulatively, between North America, Europe and Australia where protests are loudest against palm oil use, we represent one massive market that can force change! One only has to take a look back at the events that unfolded last year. The Norwegian Sovereign Fund caused major ripples when it dumped its shares in palm oil companies it saw as working unsustainably. Aggressive campaigns against palm oil by Greenpeace and Rainforest Action Network urging consumers to save the Sumatran tiger and orangutans kept the heat up on U.S. brands. Our little voices roared in 2013! Brands like Tofurky and Nutiva switched to suppliers of palm oil that used better practices in cultivation. Hershey, which makes Kit Kat chocolate bars, made a bold commitment as well by announcing that they would use only traceable sustainable palm oil by the end of 2014. With a global reach of 90 countries worldwide, this will not be an easy task for the chocolate maker but the company has informed me that are serious about meeting this goal. The best news however came in late 2013 as activist and consumer pressures built up on any company involved with palm oil. News broke on December 3 through Green Century Funds that a global institution of investors were now brandishing a $270-billion tool to reward or punish companies that produce or use palm oil. That may or may not have been a deciding factor in this next announcement that saw the world's biggest producer of palm oil,Wilmar Group commit to a no deforestation policy. The associated announcement with Unilever making a change from using Greenpalm certificates to offset their palm oil use to actual physical sustainable palm oil was huge! Even Kellogg's, which was heavily criticized for its plans to source palm oil from Wilmar, became a beneficiary of Wilmar's change of heart. How did so much good happen in such a short time? You have to remember that Wilmar Group is the biggest supplier of palm oil globally with a 45 percent share of the market. Their pledge will be felt deep into their supply chain as well, including Bumitama Group which has the dubious honor of being one of the most heavily criticized palm oil growers in 2013. As a supplier to Wilmar, Bumitama will now have to step up its own policies to keep pace with Wilmar. It could further affect two major issues with industrial palm oil cultivation which receive much less coverage than wildlife extinctions. These would be the rights of indigenous peoples in Malaysia and Indonesia and greenhouse gas emissions. The Union of Concerned Scientists in the U.S. has identified palm oil cultivation as a leading emitter of greenhouse gases. An in-depth look into their findings and solutions offered can be accessed on their website where peat lands disturbance is identified as a particularly worrisome source of carbon. Wilmar's pledge to not source palm oil grown on peat drew an immediate reaction from palm oil growers in the Malaysian state of Sarawak, where a large proportion of their palm oil plantations is on peatlands. The overall execution of Wilmar's pledge to exclude palm oil grown on peat remains to be seen. There is huge pressure on the company to go back to its old ways and it will take incredible commitment for them to stay on their new course. One of the more impressive statements involving peat lands however has to be this one. Wilmar will be developing a programme with various stakeholders to help local smallholders and farmers develop their native customary land responsibly, irrespective of whether "it is peatland or not, as we understand that indigenous communities depend on this land for their livelihood. When it comes to creating sustainable products, I will be the first one to put aside environmental concerns if it means the betterment of lives for poor indigenous peoples that will ultimately lead to better futures for their children. It will be hard to beat 2013 for all the good news that came through. As good as this all sounds, I am still very concerned over the lack of transparency by fledgling certification body, Indonesian Sustainable Palm Oil. This is a government-run scheme that would encompass every palm oil producer in Indonesia. It sounds great to have the world's largest producer of palm oil producing nothing but sustainable palm oil but at the time of this writing, only a handful of plantations have been certified. Meanwhile reports of thousands of land conflicts continue to make the news. I have not seen any Environmental Impact Assessments from the hundreds of thousands of hectares licensed to plantations in 2013, so I can't even say what their impact on endangered wildlife will be. 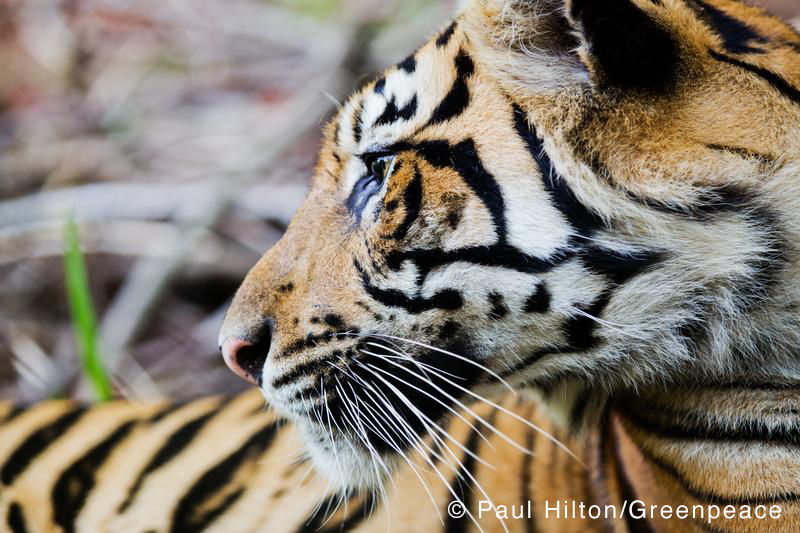 While the survival of endangered Sumatran tigers are by no means secured, the odds for their survival has improved through the transformation of key palm oil industry members. If we are to stop their extinction, we have to keep doing what we can do best and that is to keep pressure up on brands. Saving these magnificent wild animals and protecting human rights could be as simple as choosing Hershey's Kit Kat bars the next time you feel like having a chocolatey snack.